Lowel Umbrella - Tota-Brella - Silver - 27"
Fits directly onto Tota or Omni and ViP lights without tools. Slightly softens the light output, with some specular highlights. Heat resistant, woven, soft-silver surface. This size is perfect for a 1 person head shot, or 3x4 ft product setup. Tota-Brella - Silver - 27" is rated 4.1 out of 5 by 25. Rated 1 out of 5 by davidhj from poorly made-- and can be fire hazard I have used tota lights for 20 years-- the last 5 years or so the tota-brellas have been imported from China (I believe) by Lowell-- and are of very very poor quality. The thin metal ribs bend and break easily. The edges of the umbrella unravel into thin threads which blow around and of course could easily catch on fire if the loose thread gets near the hot bulb Bottom line: I used to get years of very regular use out of these umbrellas-- replaced only when the silver got dirty-- NOW-- get a few months and then the ribs bend or break or the umbrella starts to unravel or the weak string ties which hold the umbrella to the ribs break. I have talked to Lowell about this repeatedly-- even senior managerson Long Island..suggesting they get a better supplier for these umbrellas-- Basically they have told me 'tough'-- live with the poor quality. Rated 4 out of 5 by Anonymous from Great Portable Spread This is a great product to add to the array of Lowell lights. The only drawback is the easy tearing of the material. When used as often as we use them, they get worn badly around the tips of the rods causing them to eventually tear when opening or sliding into the plastic protective cover. Might could be strengthened at those areas for increased life. Rated 5 out of 5 by Anonymous from The Tota-Brella is GREAT! 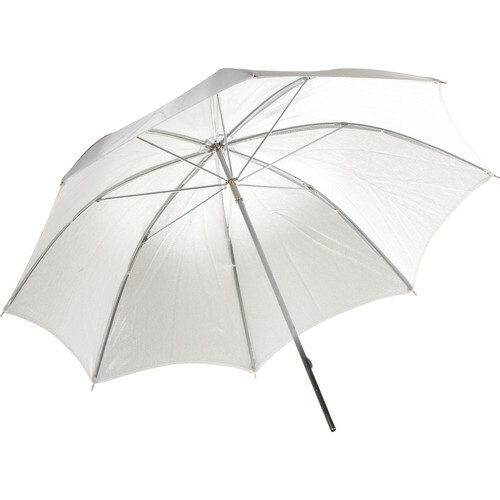 I just purchased a Tota-Brella (Silver, 27 from Lowell) through B&H online. The 'Brella is an economical and effective means to throw strong, soft light for video or even basic stills. I like it as it provides a great option when I don't want or can't use direct lighting. It's durable and compact, and great for general use, usually medium and tighter shots. I imagine one could use several on several lights at once to do some quick lighting for a wider shot. Overall, if you already own Lowell lights, I recommend the Tota-Brella. Rated 3 out of 5 by Anonymous from Works well but not very rugged. It works well for the light purposes but the metal skeleton is pretty light weight and can get damaged or broken easily. Use with care and this product will work well for you. Rated 4 out of 5 by Durph from It's OK I use this umbrella mostly outdoors. It seems fairly sturdy but it is frayed all along the outside edges of the unit. It came that way so the quality control is not that great but it is relatively cheap and does the job so I won't complain too much. I use it for fill light and it works pretty good. I like the compact size so as not to catch the wind as much. Of course you have to use a sand bag on the stand. Rated 5 out of 5 by picturemaja from Nice brella Its a great umbrella for softer light on portraits. It handles the heat from the lights well and works exactly how it should. It fits for omni and tota lights, and I can use it on strobes as well, so I prefer having these for all my lights. I have used it as a shoot through as well, which softens and cuts the light down about 2 stops.